This week we have seen a range of emotions around our house. With the start of school always comes a variety of emotions from our little ones. Children often use play to calm their fears and understand their emotions. Which is why play is so important in primary learning and should be encouraged both in and out of the classroom. Today's Lil Sprouts Book Club is a perfect story to introduce emotions and feelings and give words to what your child might be feeling inside. This story is filled with silly colorful characters that experience a variety of emotions. It helps little ones to put words to those sometimes unexplainable feelings. My daughter started VPK (preschool) this past Monday, it is her first real time being away at school. She has dealt with a wide spectrum of emotions in preparation for her first day of school. She did a lot of role playing and dramatic play with her younger brother a week before school even began. She practiced walking her brother to his new class (her bedroom) Practiced hanging his bag up (on the door knob), prepared his snack ( goldfish crackers in a bowl), put his sweater on in case he got cold... We had a whole week of her working through her anxieties and preparing herself. So this book was a great selection for us. We read this book together and talked through some of her emotions to help her put words to what she was feeling inside. 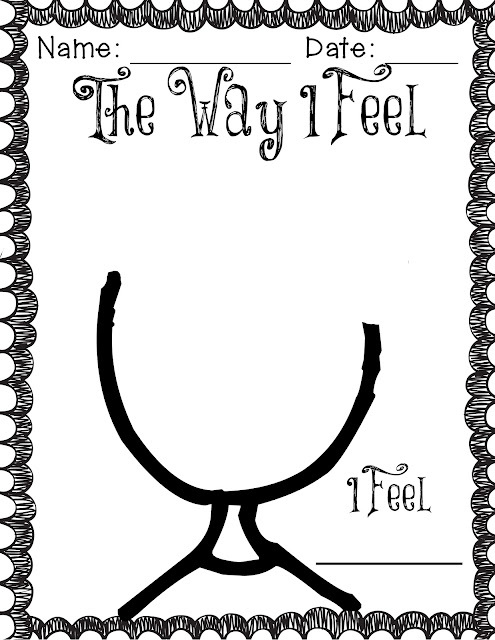 After reading this book you might find it helpful to talk with your child about their feelings, the page below will help them illustrate what they are feeling. I had my daughter draw how she felt after her first day at school. We looked in a mirror and talked about what she saw and compared it to what she was feeling inside. She determined that she was indeed happy about the first day of school. The Way I Feel Kit in our Simply Sprout Store. Later this week we will be featuring the items from our kit and show you some ways to incorporate them both in the classroom and at home with your little ones.